Willson Contreras‘ two-run homer in the sixth against Davies was unearned, and that was all Chicago could muster at the plate. Davies pitched 5 2/3 innings of five-hit ball, and Alex Claudio got two outs before handing off to Hader. 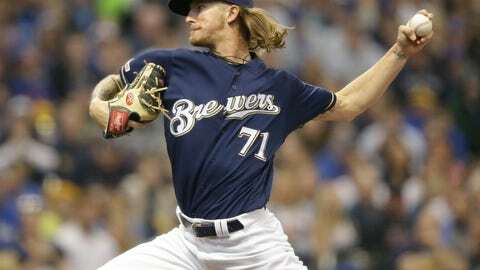 Davies cruised until the sixth, when Anthony Rizzo reached on first baseman Eric Thames‘ error and Javier Baez had an infield hit. Milwaukee nearly escaped with a groundball double play, but Contreras hit a two-run homer to chase Davies.